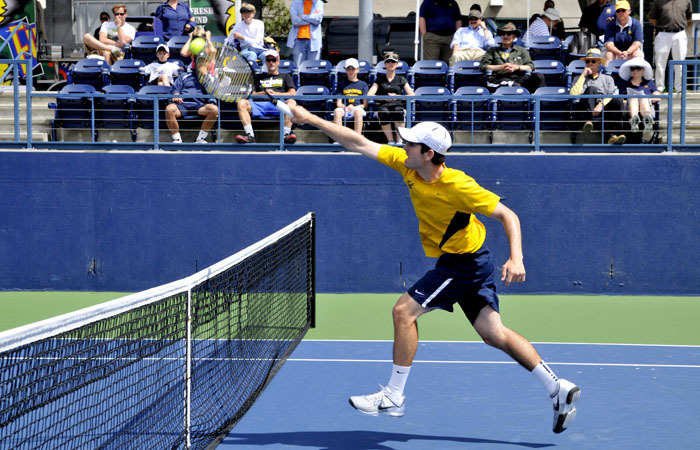 The Cal men’s tennis team ended last season with its most successful NCAA Championship run in recent years, reaching the sweet 16. And despite losing top player Pedro Zerbini, Bears’ coach Peter Wright is confident in the team and its abilities. That lack of star power is mainly due to Zerbini’s departure. The Bears’ former team captain and current undergraduate assistant coach has left a noticeable hole in Cal’s lineup. He was ranked 20th in singles at the end of last year and was Cal’s highest rated player for much of the last three years. It will be difficult to replace such a standout talent as Zerbini, but many of the seniors are showing promise, in particular Northern California native Nick Andrews. For the past two weekends, Andrews has attended preseason tournaments, faring considerably well at both. At the Olympia Fields Tournament two weeks ago, Andrews upset Casey Watt, Notre Dame’s top player. And this past week, he won the Napa Valley Classic, beating teammate Ben McLachlan in the final. In addition to Zerbini, two other senior rotation players were lost in Jonathan Dahan and Bozhidar Katsarov; however, the team gained two freshman players – Andrew Scholnik and Andrew Pises – as well as a new senior in UCLA transfer Ahmed Ismail, who won five of six dual matches for the Bruins in 2009. In spite of the loss of several seasoned players, Wright is convinced that the team is still as strong as ever, noting the team’s depth as one of it’s strengths that will help propel it through the season. As usual, the Pac-12 field will surely not make life easy for Cal, seeing as it is always full of highly ranked competition. While Cal has never won an NCAA team championship, UCLA and Stanford have earned 16 and 17 NCAA titles, respectively. And last season, USC took home the NCAA Team Championship title for the 19th time in program history — and its third in a row. This year, the team is surely looking to do so again. Stiff competition will also be found outside the Bear’s conference schedule, as the team is slated to face Duke at the Blue Devils’ home courts before conference season. Duke’s Henrique Cunha is currently ranked No. 4 in preseason polls and the club’s doubles team of Cunha and Chris Mengel is ranked 15th in the nation. Despite some recent preseason successes, namely Andrews’s win at the Napa Valley Tennis Classic, Wright is not getting ahead of himself. The modest coach has set a rather reasonable goal for the promising team this season. Cal’s lack of standout players may be noticeable, but Wright believes that his “blue collar” team may be able to repeat its successes of last season.